Artisan Box - Original, quality, artisan products from India. 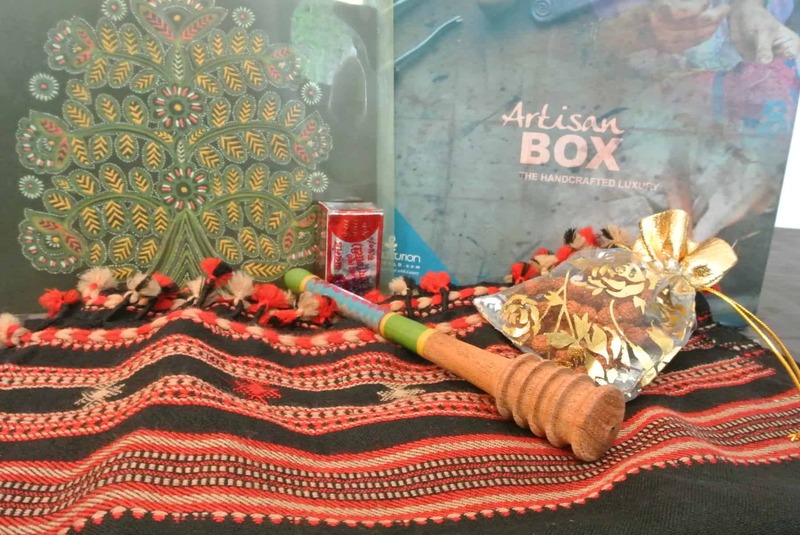 Artisan box is a subscription box created by Luxurion World which is a website focusing on luxury Indian items. The concept of the box is to send you a variety of lifestyle products which are handmade, artisan items from craftsmen and women in India. It also follows a theme of environmental sustainability and organic content. The region of India changes from month to month, so it also exposes you to the different types of craftsmanship and culture to be found across the country. A recycled plastic multi-purpose bag. My favorite item is the woolen scarf. It is beautifully designed, clearly of high quality, it looks great on and it will keep my neck fashionably warm all winter. The honey dipper is something which we will be able to bring out when we have guests over. The Rogan art is well done and will look great in our hallway once framed. The face soap smells nice and has been a great face soap for my husband. Even the recycled bag has found a use as my travel make-up bag. Overall, I found everything in the box to be of high quality and something which I could find a good use for or use for decoration in the home. The originality and the great quality of the products make it also the perfect gift for any beloved ones. No deals for the moment. How would you rate The August 2015 Artisan Box ?